It’s back. America’s most-watched professional sport has returned for the 2016-2017 season. Football is an undeniable phenomenon across the country. Every week from August to January, families and friends will gather to watch their favorite teams duke it out on the field. Careers, rivalries and records will be made or broken across 120 yards from week one to the Super Bowl. Here at Spike’s, we’re excited to see what the new season brings, not only in professional football but in local schools and colleges as well. We think all sports awards in New Jersey are a big deal, however, we know how hard teams work to achieve local supremacy. With the start of football season, we thought we’d take a moment to highlight some of the awards given out for the performances during the NFL season. Previously called the “Jim Thorpe Trophy,” the AP MVP Award is given to the most valuable player from the regular season. 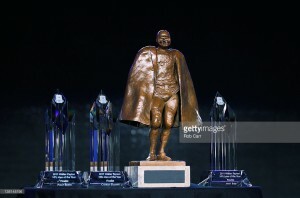 The award is usually presented to the most outstanding offensive player from the previous season, but a defensive player has received the award twice in the 59 years it has existed. Peyton Manning holds the record for most awards with five occurrences and is the only player to ever receive the trophy on two separate teams (the Colts and the Broncos). Johnny Unitas and Brett Favre are closest to Manning’s record with three a piece. This past year, Cam Newton received his first award for the 2015-2016 season. 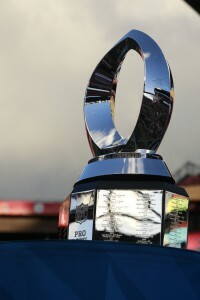 The award is similar in appearance to the Lombardi Trophy, with a silver football standing atop a base of various materials. Throughout the years, the award has changed appearance from time to time but has usually maintained the realistic depiction of a football. While every other award is given for performance on the field, the Walter Payton Man Of The Year Award is given for performance off of it. The player that shows the most dedication to improving their community and supporting noteworthy causes is presented with the trophy at the Super Bowl each year. The award depicts Payton in bronze, wearing full equipment with a coat around his shoulders as he stands with his hands on his hips. The Man Of The Year Award is among the most coveted in the league and encourages players to enrich their communities as best they can. To create your own special honor award, contact Spike’s Trophies, the area’s leading producer of commemorative items of all types. This entry was posted in Uncategorized on September 10, 2016 by Spike's Trophies.